There’s been quite a big ruckus in the search community of late over Google’s decision to encrypt all keyword search activity (except for paid ads). What this means is that Google will no longer be providing the organic keyword data that you may be used to seeing in your analytics reports. And it doesn’t matter whether you use Google analytics or any other tool, you will not be able to see keyword data from organic Google traffic. Instead you will see “not provided” as your primary keyword from all traffic that comes from Google. The Big G had already been encrypting keyword data for users who were signed in to their account while searching Google since October 2011 so if you monitor your analytics you are already used to seeing “not provided” in your reports. Just get used to seeing a lot more of it now. Of course Google can still see this info…..but you and I cannot. What can I do to get more information on keywords that are driving traffic to my site? While you will not be able to tell the specific keywords being used any longer from your Google traffic there are few other ways to still get some additional information about what keywords are sending traffic. 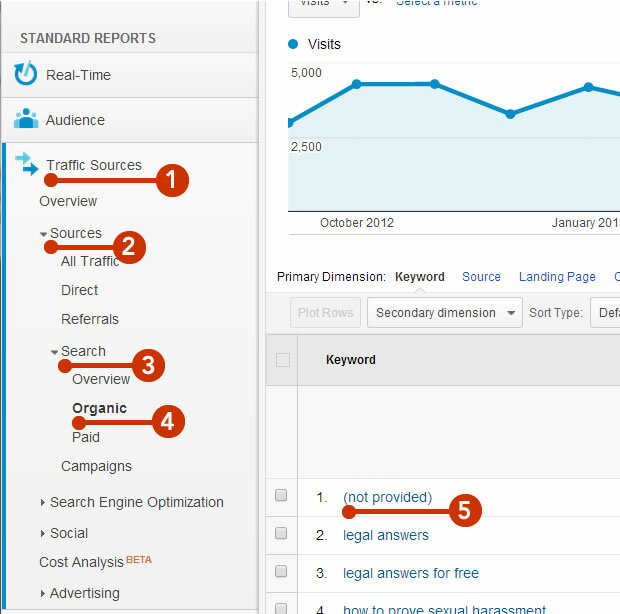 Visit the organic keywords section of Google analytics. If you don’t know how to find your organic keywords in GA, log into your account and drill down as shown in 1-5 below. Most of you probably know how to do that but many have never added a secondary dimension in analytics (sounds tricky but it’s incredibly easy). After you have clicked on “not provided” in step #5 above, you will need to add “landing page” as a secondary dimension as shown in steps 1-3 in the image below. Once you click on “landing page”, you will see the pages that people are landing on when they come to your site. For most law firms, the home page is usually the single page within your site that gets the most traffic. 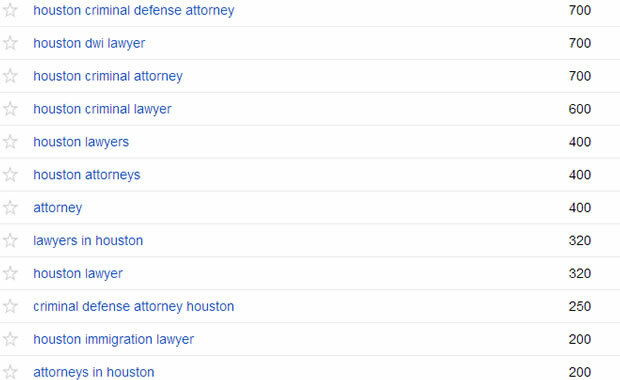 If you’re home page ranks for lots of different keyword variations, you will not be able to tell whether a visit to that page was a branded keyword (“Smith and Wesson Law Offices”) or a non-branded keyword (“car accident lawyer Las Vegas”). However if your home page does not rank on the 1st page of Google for the coveted non-branded keyword phrases that most marketers are targeting, the majority of your traffic is going to be branded search phrases. For internal pages within your site, you will be able to get a better idea of the types of keywords that are driving traffic and usually (unless it’s an attorney bio page or about us page, etc.) internal pages are being driven by non-branded keyword phrases. 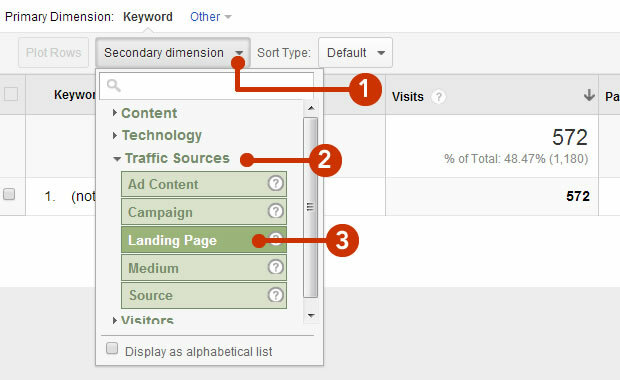 If you know an internal page on your site is ranking for a certain keyword phrase or other related long-tail searches and that page is listed on your top landing pages, using this method you will at least get a good idea of what keywords are driving traffic to your site. 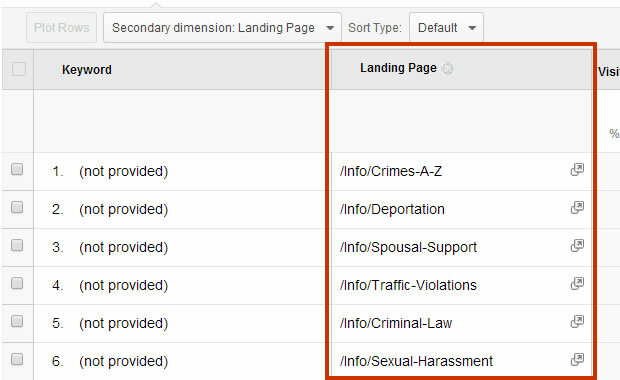 You should also be using the landing page reports to help determine what pages to keep or to get rid of on your site. Having analyzed hundreds of law firm websites sites in the past year alone, all too often I see low quality content pages that get virtually no traffic. They are also often the same pages that have a very high bounce rate and/or very low time spent on the page. If you’re smart, you’ll get rid of these pages as Google is already taking into account your visitor behavior on your site. Things like this can only hurt your organic search rankings so if you are thinking “the more the better” when it comes to content, that’s not the case. More high quality content that engages your users or gets them sharing socially is really what you want on your site. 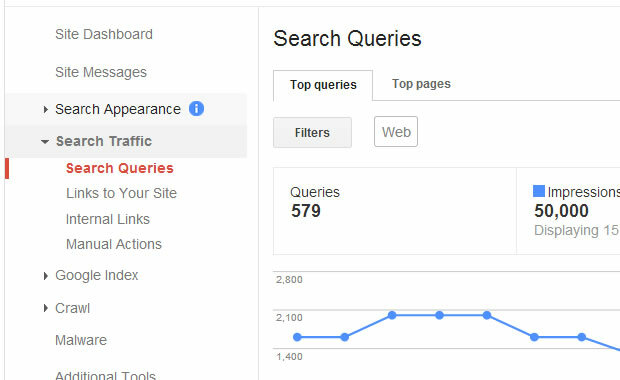 If you log in to webmaster tools and visit the search queries section, you can see a list of keywords that your site is getting impressions for as well as some click data. This has not been the most reliable source of data but you can at least get an idea of some of the keywords sending traffic to your site or at the very least some of the keywords your site is showing up for. It also currently only has 3 months worth of data although Google apparently has plans to increase that to a full 12 months of data. It’s “funny” how Google ads are not encrypted, making their decision to “provide an extra level of protection” to users a bit questionable. Many in the Internet marketing world are wondering if this is simply a way for Google to generate more ad revenue. However it is what it is so Google is not going to change their move to secure search. PPC is a way for you to know for sure what keywords you are getting traffic for so if you need to know, start running PPC campaigns. We’ve never been fans of focusing so heavily on keyword rankings in the past as many law firms tend to be obsessed with a single or small handful of keywords. The reality is that the majority of law firm website visitor traffic from unique keyword phrase combinations so we know how important it is to get rank for a wide variety of search phrases. Ultimately what matters to us is delivering traffic and leads for our clients so that you can turn that into new cases. With keyword traffic from Google now being encrypted, it’s now important to be able to monitor the keywords you are ranking for in order to combine that with landing page metrics to get a better idea of what keywords are sending traffic to your site. Below are two screenshots from iLawyerMarketing’s rank tracking software. 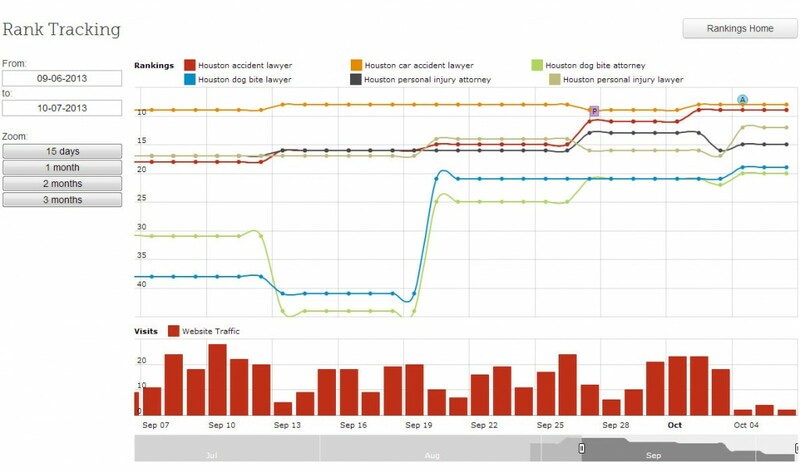 The first shows a ranking history chart with a website traffic graph underneath. 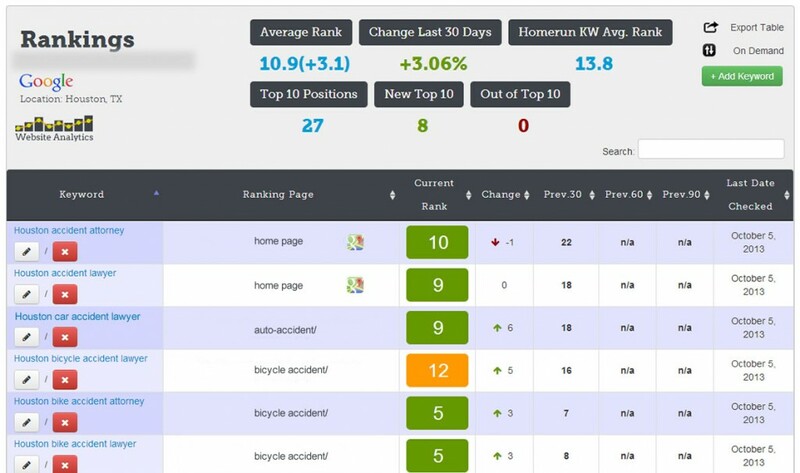 The image below shows some important ranking metrics such as top 10 rankings, average rank, Homerun Keyword average rank (the most important and most competitive keywords), new top 10 rankings, change from previous rank checking rate, previous ranking positions and what page is ranking for the corresponding keyword. Even with rank tracking it’s important to keep in mind that personalization of search changes many things so you cannot even rely completely on ranking software like ours. One signed in user in Manhattan will often see different results than a non-signed in user in the same exact area depending on their search history. Someone searching Google on on a mobile device in Los Angeles will often see different results than a friend searching from his laptop computer at Starbucks right down the street. Personalization of search means different people see different results but you can at least get a good idea of what most people will see in the search results. It’s without question an important part of being able to determine what keywords are driving traffic to certain pages of your site now that we are in a world of 100% encrypted organic searches. There is no use in crying about the way Google has encrypted keyword traffic. Nothing can be done except for us to adapt and make the best of it. The world of Google and search is constantly evolving and you need to do the same if you want to make your marketing work as efficiently as possible.